Foundation earthing was put into full action on March 2006 according to the Hellenic Organization of Standardization (ΕΛΟΤ) HDD-384 Standard and is considered to be the basic earthing function and protection in new construction sites. The foundation earthing’s study has to be completed before the start of construction works. Its construction requires specialized technicians and comes at the same time as strap beams concrete works. 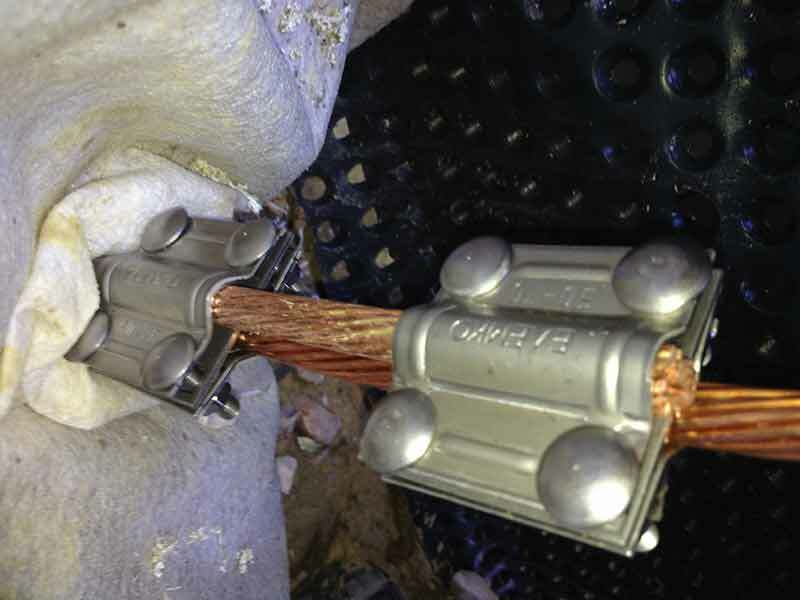 It is incased into the concrete and electrically connected to the construction’s armor, achieving the best earthing with the minimum resistance rate compares to other types of earthing. It can also be used for the earthing of lightning protection, reducing the total cost, since the installation of a new earthing system in a future placement of lightning protection will not be necessary. How is foundation earthing built? A steel or copper band is placed circumferentially of the foundation, fixed with clamps on the concrete’s armor. Connections between steel or copper parts are only made in the concrete. Connections of the same type outside the concrete are only made with stainless parts. As mentioned both in international bibliography and relevant IEC Standards, there is no danger when copper is placed in the foundation and the same goes for steel. The reason is that the electrochemical voltage of every material depends on the material itself and the material surrounding it. Inside concrete, steel acquires the same electrochemical voltage as copper and therefore there is no corrosion danger. In spaces such as boiler rooms, engine rooms of elevators or pools, bathrooms, WCs, kitchens, electrical panels and counters of the Public Power Corporation S.A. (ΔΕΗ), earthing terminals are placed, used for the connection of incased conductors with external conductors. For the foundation earthing’s connection with a lightning rod, a conductor is placed inside the pillars before the concrete placement, ending on the building’s rooftop. Circumferentially on the rooftop, an aluminum or copper conductor is placed on braces, in spots that include chimneys, solar water heaters, etc. Then spikes are placed and the construction of the lightning rod is completed. 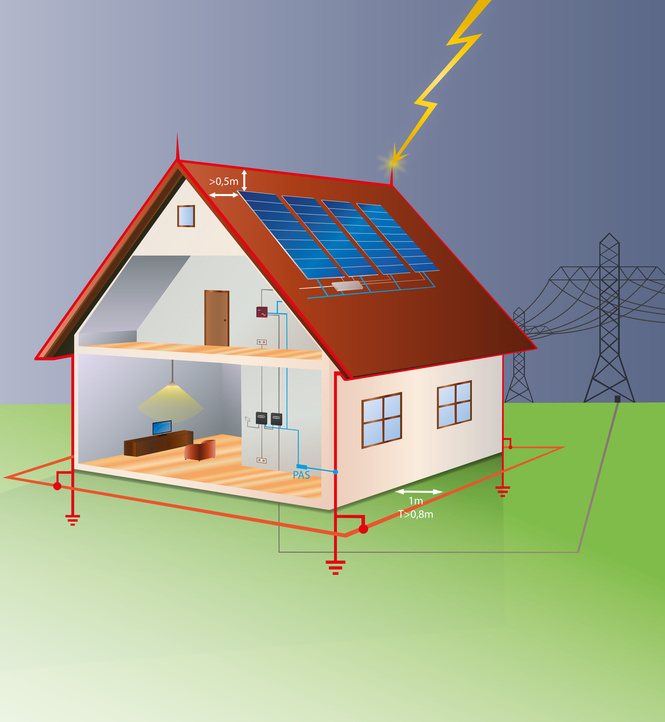 The earthing’s installation is very important for the construction of a building and there are many materials to be used and many different ways to do it. The coordination and conclusion speed are also very important as the earthing is usually done at the same time as the foundation and therefore requires the cooperation of electricians with the crews in charge of concrete, in order to avoid expensive delays or mistakes. Our company possesses the required experience and a large crew of specialized technicians, in order to act promptly, in combination with the rest of the simultaneous construction works, never compromising the installation’s quality. According to the current legislation, foundation earthing is mandatory for all new construction sites. With the installation or lightning pods or Faraday cages as means of lightning protection and its incorporation in the foundation earthing, our company offers you a complete protection system. Our engineer will compose a study, consequently implemented by our electricians, following the relevant standards and obeying all determined rules, in order to deliver a complete earthing installation that will protect your construction site’s buildings. 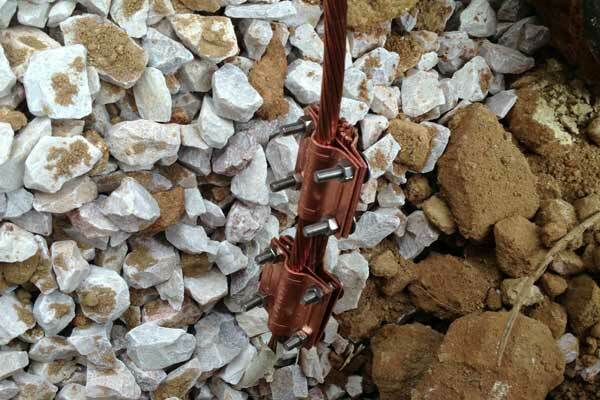 For the earthing’s installation we can use various electrodes (such as rods, bands, plates, grids etc) according to the study’s requirements. Taking all current standards into consideration, our electricians will install the foundation earthing choosing optimum quality materials. For the foundation earthing’s construction, we use a 30×3,5mm heat zinc-coated steel band (St/tZn) of 500gr/m2 zinc-coat thickness, placed in the foundation of the buildings, inside the concrete. If the size of the building is large we also place a steel band on connecting poles or walls in transversal or longitudinal axis, making sure that any point in the inner foundation’s plan is not further than 10m from the earthing. When the steel band is interrupted, we extend it by placing a special joint. In case the building has compression-expansion joints, we stop the band vertically as it passes the joint and then continue its extension with the placement of a pair of special joints. For the installation of ends in the building we place a 10mm steel conductor which we connect to the steel band with special joints and lead it to the building’s corners inside the concrete poles. In order to avoid its corrosion, our electricians wrap it with an anti-corrosion band, approximately 35cm before its exit from the concrete (inside) and 35cm after its exit (outside). They leave ends inside the building (boiler room and elevator shaft) and outside the building for the connection of the foundation earthing with the Public Power Corporation S.A. (ΔΕΗ), in case of an expansion of the earthing system. 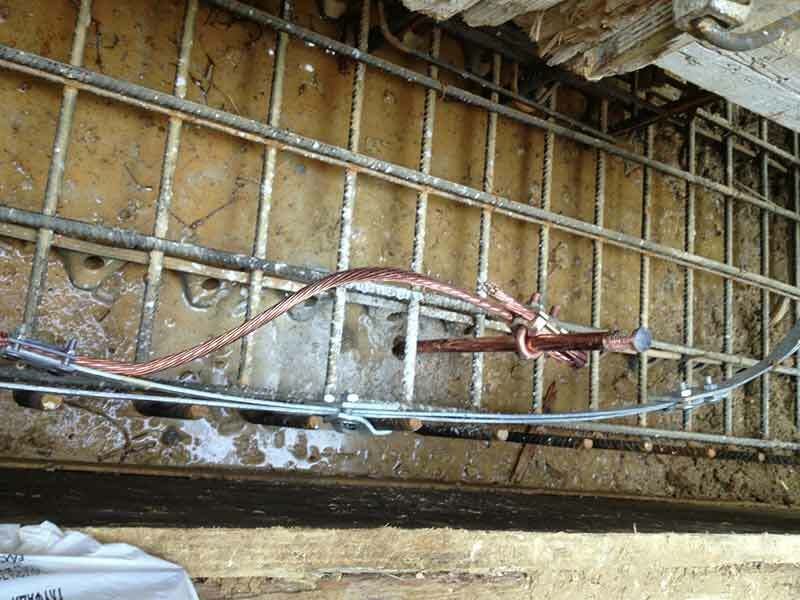 Foundation earthing is the main means of protection form electrocution and other dangerous situations but it cannot protect you from all dangers. There are weather conditions such as lightning that can cause serious problems to your electrical installation and the building’s equipment. We cannot predict the strike of a lightning but we can protect the installation, as we know the behavior of the phenomenon and the damage such a strike can cause. A lightning is basically a very high voltage current. The installation cost for a lightning protection system is very low compared to the catastrophic consequences a lightning strike can bring both on the equipment and the life of the residents of the building under construction. There are specific standards defining whether a construction needs lightning protection or not. Our company will make the evaluation and in case your construction requires protection we will suggest the best solution. Using only certified materials, our electricians will install the lightning protection, which combined with the earthing installation, will create a complete safety and protection system for your construction.